3M 4991F mm40x1m. 3M 4991F VHB BIADESIVO IN SCHIUMA ACRILICA GRIGIA. 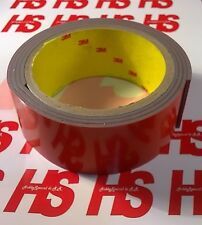 n.1 rotolo mm40x1m spessore mm2,3 di biadesivo in schiuma acrilica conformabile grigia compatibile con PVC plastificato 2 salviette VHB a base di alcool isopropilico per la pulizia della superficie. Verbatim Digital Movie Combo 8 Pack DVD-R(6) DVD-RW(2) Sealed See Pics And Info. Condition is New. Free shipping. One package has slight damage to the outer seal but none of these have ever been opened. Price is for all three packages. If you have any questions please don’t hesitate to ask. Thanks for taking a look. 20 TDK DV DIGITAL STANDARD MINI DV. You will receive 2 boxes of 10 tapes. Tape is blanked and includes hard case. Motorized-VHS-C-Cassette Adapter VHS-C-VW-GTE7E-Compatible "JVC~RCA~PANASONIC "
(Motorized So Tape Loading And Unloading Is Fast And Easy). Motorized, so tape loading and unloading is fast and easy. 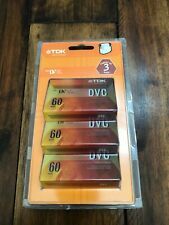 Easy Conversion From VHS-C To Standard VHS Format. Recording tab can be removed to ensure you don't accidently erase tape while it's in the adapter. U-matic SP Video Kassette. Sony KSP-60. Das Band ist neu. 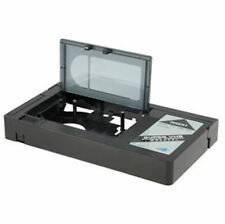 This compact video cassette is a VHS-C cassette conforming to the VHS format and can be used with all video cassette recorders having a VHS-C mark. Der Verkauf erfolgt unter Ausschluss der Gewährleistung. Auf Wunsch würde auch überweisen gehen. 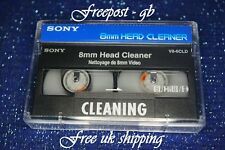 3 in 1 (Cleans, Cares & Prevents) HEAD Cleaning Cassette for Video 8, Hi 8 and Digital 8 Camcorder. 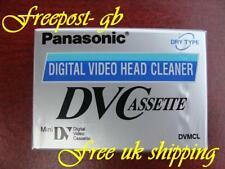 This Head Cleaning Cassette will only work with Video 8, Hi8 and Digital 8 range of camcorders. Insert this head cleaning tape. New and straight out of the box. Selling off our stock of new BetaSP and Digital Betacam tapes. We have other lengths in our other auctions, so please check them out if you need longer or shorter tapes! SHARP VR-72CA VHS-C SVHS-C CASSETTE TAPE ADAPTER. In mint perfect working condition. 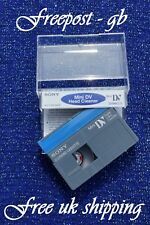 Lot of 2 New sealed Sony DVM85HDR cassette tapes. Rare item since. FujiFilm DP1001 DVCPRO HD 64EX/32L Tape**Brand NEW! They are being sold individually. 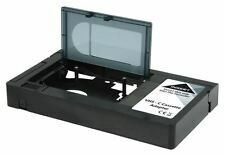 MAXELL DVD-RAM VIDEO CAMCORDER 8cm MIni DVDRAM. Maxell 2.8GB (60 Minutes) Double-sided DVD-RAM Round Caddy Disc for DVD Camcorders - with Jewel Case. These Maxell DVD-RAM discs are rewritable and re-recordable, so they are perfectly suited for recording and re-recording with DVD-RAM compatible camcorders. Panasonic DVCPRO HD 126XL ** AJ-HP126EXG**BRAND NEW! 1 - Pre-owned "Video Family Album" vinyl Case holds 3 tapes. THIS IS THE MINIDV HD FORMAT. A NTIQUE & C OLLECTIBLE C ENTER, B EAUTY B OUTIQUE. OR ANY OTHER ITEM. DUE TO THE NATURE OF THE PRODUCT BEING REPRESENTED FINAL SALE ONLY. NEW YORK CITY AREA. M EMORIBILIA A UTHORITY,I T'SO NLY R OCK -N -R OLL. DVCAM format: 184 minutes. - HDV/ DV format: 276 minutes. 2 FUJI HQ EC-45 For Tough and Durable Recording VHS-C Compact Camcorder Cassette. This Fuji HQ (High Quality Plus) Cassette will only work with VHS-C range of camcorders. This Fuji HQ EC-45 tape is ideal for where tough and durabe quality recording is paramount. Lot of 3 NEW Sony KCS-20BRS Video Cassette Tape U-matic Condition is New. Shipped with USPS Priority Mail. Nice lot, shot and viewed once, then put away, excellent condition. 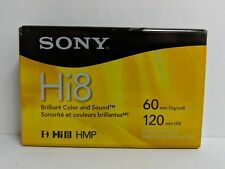 SONY 120 Video Hi 8 / Digital 8 Video Cassette.